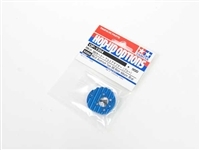 This spur gear adapter allows the use of many of Tamiya's spur gears found in some of its Touring Car machines to be used with the RM-01 chassis kit. These lightweight, aluminum ball connectors are designed for use with the RM-01 chassis' steering section and feature a fluorine coating to ensure smooth steering operation. 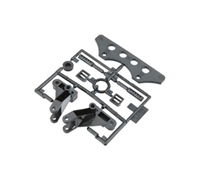 They have a lower height than the kit-standard parts and settings may be adjusted through the use of spacers available separately. 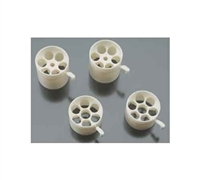 Fluorine Coated Ball Connector x 4pcs. May be used with the RM-01 chassis. 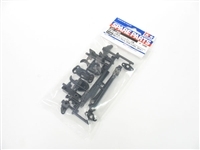 The kit included N (front suspension arms) parts are made of a glass filled plastic. 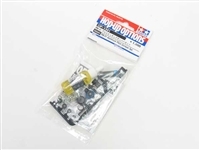 These Hop-Up-Option N parts are made of CARBON filled material plastic. By using carbon filled suspension arms you will notice less flex during hard cornering. 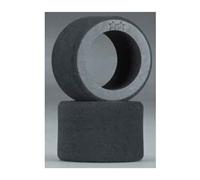 The use of using carbon filled plastic also yields a part that is lighter in weight compared to the standard part. Lightweight, reinforced parts offer improved handling and the ability to apply a more precise set-up to your machine. These RM-01 chassis fluorescent wheels can make your car more visible on the track, especially at indoor circuits or in cloudy outdoor conditions. Fluorescent Pink Front Wheel x 2pcs. Fluorescent Pink Rear Wheel x 2pcs. Fluorescent Yellow Front Wheel x 2pcs. Fluorescent Yellow Rear Wheel x 2pcs. These are V Parts (Damper End Adjusters) for Item 54341 RM-01 Aluminum Pitch Damper Set and Item 54342 RM-01 Aluminum Roll Damper Set. Compatible with Item 54341 and 54342. 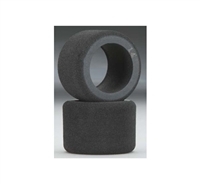 These Fluorine Coated Pivot Balls are used as part of the Side Links as well as the Center Pivot on the rear suspension of the RM-01 chassis. 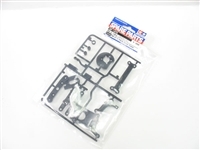 The kit included L parts are made of a glass filled plastic. increased rigidity and the parts are lighter in weight. 2 L tree pieces included. The RM-01 chassis uses 1150 Ball Bearings on the front axles as standard but these steel axle shafts will enable installation of 1/8 x 5/16 ball bearings which are also widely available. The use of these axles will also allow you to use different branded wheels and tires for more tuning options. 3mm Lock Nut (Thin) x 2pcs. By adding these spacers to the rear shaft of the RM-01 chassis, rear tread width can be finely adjusted to match track conditions. 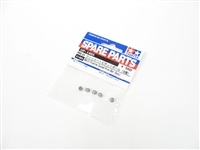 Spacer (0.5mm thick) x 2pcs. 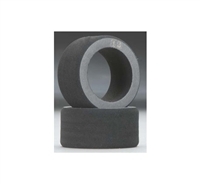 Spacer (1.0mm thick) x 2pcs. These king-pins have a durable titanium coating to increase the smoothness of the front uprights' movements. These optional sponge tires are for the RM-01 1:12 scale racing chassis. These tires offer increased traction compared to the kit-standard tires. Item comes with double-sided tape for attaching the tires to wheels. The Aluminum motor adapter replaces the kit-standard parts to increase motor heat dissipation efficiency. This adapter can also be used on F104 chassis machines to enable installation of a Type 380 motor. 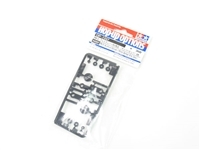 Compatible with RM-01 and F104 chassis machines. Compatible with RM-01 and F104 Ver.II chassis machines. This aluminum oil damper replaces the kit standard plastic friction pitch damper to offer more effective shock absorption to increase stability. 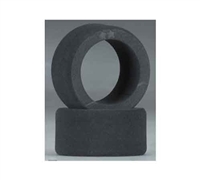 Spring tension can be adjusted by rotating cylinder nut. This damper is also compatible with F103 and F104 chassis machines. Aluminum Pitch Damper x 1pc. Unpainted Spare body parts set of the Porsche 956 Joest Racing Team. 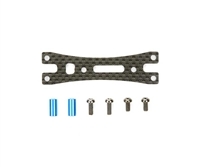 This 2.5mm thick carbon-fiber lower brace replaces kit-standard FRP component to increase rigidity of the motor mount section for enhanced power transmission efficiency. RM-01 Carbon Lower Brace x 1pc.